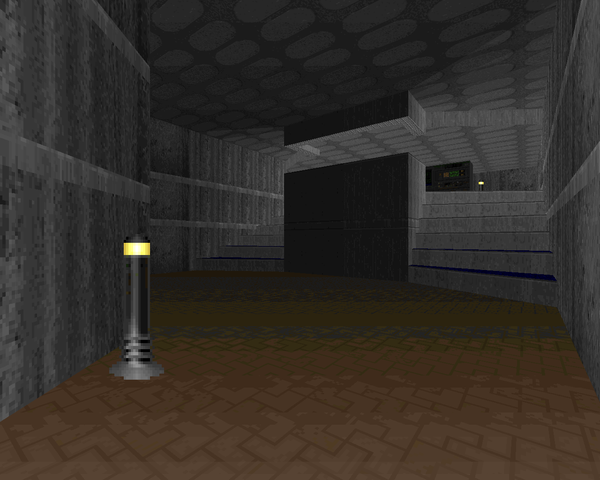 Mal Blackwell has all of two single-player Doom maps to his name, but he's been a level designer on some of id's more contemporary releases, like Return to Castle Wolfenstein and Doom 3. EDEN is the first of his works, published in 1994. It's an E2M1 replacement that he felt was roughly on-par with the original trilogy, "an extension of the original game rather than 'my' level". The story is simply presented as an aside – "there's trouble in paradise, Go clean house!". It's an interesting suggestion, that the E1 aesthetic (as the map is undeniably more Knee Deep in the Dead than the Shores of Hell) is the most evocative of Zion. First, some clerical notes. Eden is one of those unusual Doom 1.2 maps, requiring a -complevel 0 flag in complevel ports if you want to finish it (alongside Return to Phobos's E1M2). 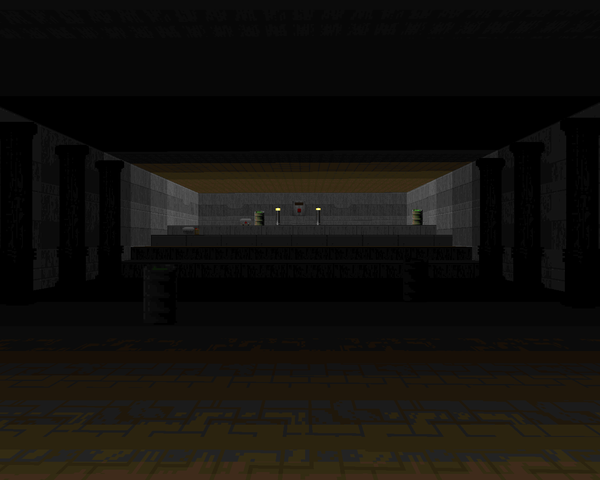 Even if you tackle this detail, prepare to get stuck, as all three of the level's keys are located behind difficult to find secrets, which distances it quite a ways from the original Doom levels. It's also packed in tight, like his other level (REDRUM), but with a much simpler (and smaller) layout. I like the architecture and detailing. There are some unusual room shapes and nice staircases. That cross mark in the center of the level is a good visual hook (and it doesn't damage the player!). EDEN is a pretty laid-back map. You've got quite a bit of leeway when it comes to ammo and health and most of the monsters are Doom regulars with the exception of a few cacodemons and barons. Heck, the outdoor finale can be finished from the safety of an invul sphere. The most interesting fights are of course the larger, pitched battles, like the concrete courtyard with snipers in the upper window, or the series of consecutive ambushes to be found in the level's eastern section, including some dangerous spectres in the dark. You can't really pass the plasma rifle by, though, so you should be good for taking down most of the monsters in the latter sections of the map. If you're looking for another Episode One-style map and acknowledge the hiding of the level's keys as a challenge (which will doubtless be a deal breaker), you should download EDEN and give it a shot. 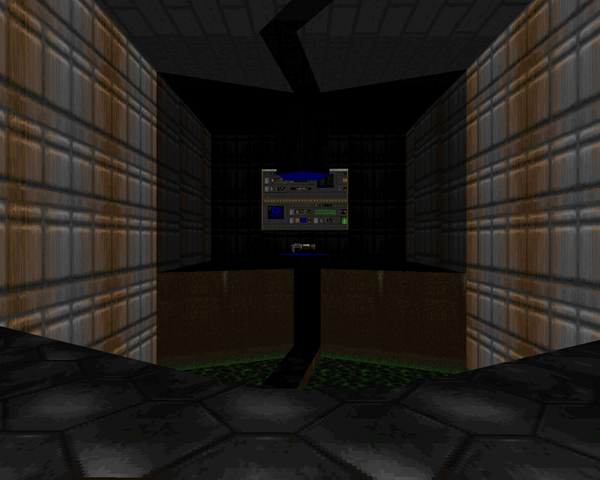 It's a really old map, coming from the end of April of '94, but it's certainly one of the better-looking early Doom levels I've had the pleasure to play. It's a pity he wasn't a more prevalent author; I would have liked to see what he did with Doom II and better-tuned mapmaking skills. 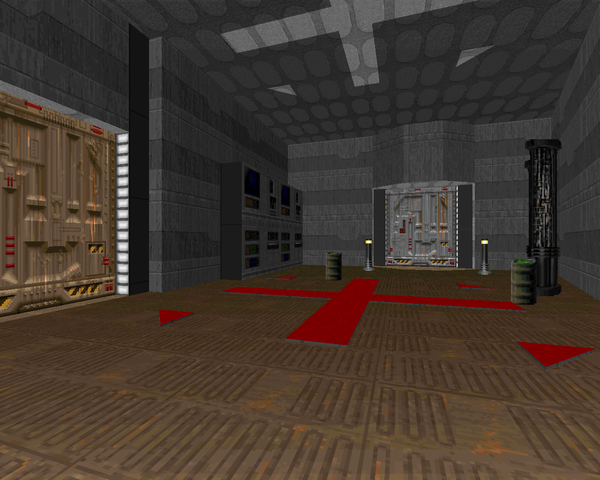 Regardless, here's a pretty nice early Doom map for those churls whose bile rises whenever they read 1994. Haha, nope! But that looks plenty interesting enough.